Recently, the QSR industry has been struggling with customer apathy. Faced with a barrage of signage, those driving by simply look at all QSRs as more of the same. We have all seen the attempts at differentiation, like the famous dollar menu… now some offer “premium” food made to order, coffee bars, and healthier food choices. Regardless of these attempts, the QSR industry remained flat over the last few years, with the recent good news that it is now growing. This begs the question of what is driving this new found growth? The answers lie both inside and outside the QSR. T he most significant trend is to create a memorable experience by capturing attention at the front door, sustaining it through ordering, dining, and then exiting. It is the full customer experience that is the new objective, and drives repeat business. To make good on that promise, a multitude of strategies are coming into play. Choices of menu items are expanding and the quality of food is improving, with a big trend on healthier food choices. Customer loyalty and connectivity is top of mind. Customers are demanding food that is both good and fast, and this must be improved upon and maintained if growth and repeat business is to be achieved. When we talk about the experience, keep in mind the importance of staff. A typical QSR will turn over its entire staff annually, creating a constant need to enforce messaging to staff who cycle through, plus building consistency for the customers seeing a new face behind the counter every time they come in. While hiring and training quality staff is a critical part of the equation for customer satisfaction, this part of the business is transient. This requires an approach with value that a customer can expect on every visit. Part of that customer experience is the look and feel of a QSR. It is not enough to have a counter with a menu above it. Now we must create a cohesive interior design, with a combination of printed signs, digital signage displays, kiosks and Wi-Fi service that ties together branding inside and outside of store. From a signage/display perspective a QSR needs to employ various sizes, formats, and configurations to maintain the attention of their customers. One area of design that is often overlooked, is outside the store… specifically, the drive through. 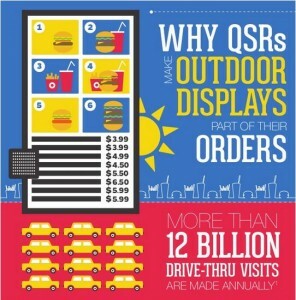 By most estimates, well over 50% of QSR sales are takeout and drive through! Making drive thru’s more visible, efficient, and user friendly needs to be a strong focus of 2016. One major pain point is the lack of visibility of the drive through displays. 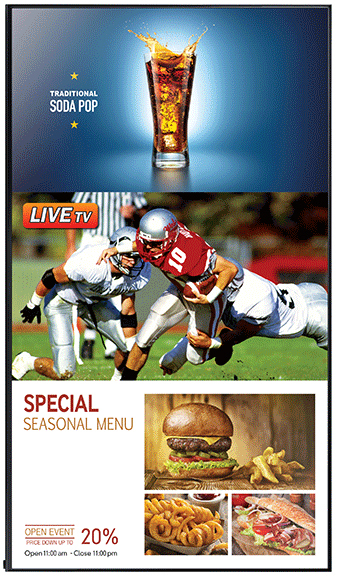 The typical indoor digital signage display is 300 to 400 nits of brightness or about as bright as your TV at home. If used outside it competes with the sun, looking dim, less colorful, and less readable… and as a result does not properly inform, promote, and sell. One solution is to incorporate a high brightness display like Samsung provides at 2,500 nits. In addition, certain Samsung models are IP56 rated, removing the need for a separate enclosure. Samsung has also incorporated their System on a Chip that can eliminates the need for a separate media player. Voila, several problems solved. 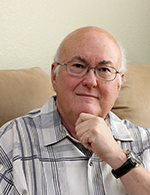 Want more information – visit Samsung’s Insights blog article. The QSR experience is evolving rapidly. What was once a matter of putting up a static sign and providing fast food, is not enough for consumers today. To earn their business, they expect more. They demand high quality food served quickly and in an enticing environment that will make them want to come back.